It seems everybody today is talking about the need for a greener environment and technology that can be used to achieve it. Thailand is no exception and is soon due to burst onto its predestined path towards solar energy. A German based company, ASW Engineering, therefore chose a Pattaya location for its Thai-German pilot water aeration project. The Aerator S2 uses sunlight to power its unique twin blade design rotors. The venture is the brainchild of the company’s CEO and inventor Alfred A. Wilhelm and the managing partner Klaus K. Waldhecker. 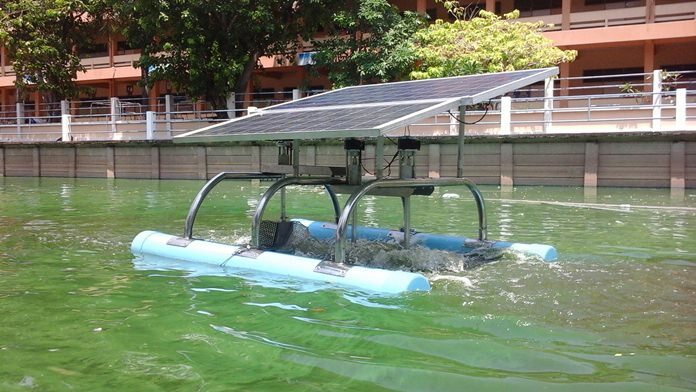 The recent pilot test consisted of an “Aerator S2” machine with four motors powered by solar energy that was launched onto the lake at Wat Chaimongkol temple in Pattaya. The lake water was almost overcome with green algae when the ASW Engineering machines were set up, yet after only one day of operation you could already see much less of it. The developers say this fast effect is a result of ASW Engineering’s new rotor blade design, which includes two stages of blades. The first level injects oxygen into a large surface area of water and the second level pushes it more than one meter deep. The company says the design of the Aerator motor means that it is twice as efficient as a conventional paddle wheel system. The Aerators can be used in ponds and lakes as well as fish breeding and shrimps farms. ASW says the Aerator offers a great return on investment and virtually pays for itself after just one year of use. No power cables are required and there is no energy consumption to pay for – just let the sun do its work. For more information check website: www.aswhitec.com. Previous articleCosmic curveball: Is the universe expanding even faster?